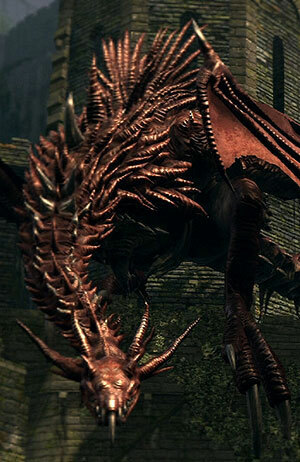 A huge red drake that is guarding the bridge to Altar of Sunlight in the Undead Burg. He is more powerful than most bosses in the game, and his attacks are relentless and ruthless. Though the player has to pass that bridge at least partially to advance, it is not necessary to kill this enemy to complete the game. but they are likely their distant kin. Hellkite Dragon will make a brief appearance early on, where it won't engage in combat. It'll then appear at the large bridge after Taurus Demon, next to where Solaire of Astora is. Here, the dragon will fly across, engulfing it in fire, and then perch itself on top of the gate at the end of the bridge, blocking access to the Altar of Sunlight. It can be triggered to fly away and reappear here as long as the player hasn't killed it. Drake Sword - tail cut, automatic pick up. The dragon heals when his HP drops below 50%, signified by him covering himself with his wings and will not attack. The healing process is slow, so you can pass safely beneath the dragon to access the altar. When you get to the Sunlight Altar without killing him, he'll fly away but, he will not disappear forever. Upon returning, depending on how you approach the bridge, he will repeat his encounter cycle. With a little bit of Vitality and armor, you can viably survive a hit from its wide-area fire breath attacks, which will knock you down, preventing further damage and letting you survive. Blocking it with a weapon or shield however will prevent you from being knocked down, which will increase the fire damage and most likely kill you. Unlike most of the game's enemies, the drake's fire breath can damage invading phantoms, so be wary of running onto the bridge during PvP. The dragon's behavior depends on whether you've unlocked the shortcut below the bridge by kicking the ladder. Until you've done so, he'll have a shorter aggression range for his fire breath attacks, and will never leave his perch unless attacked. The dragon will appear from above and behind once you start stepping onto the bridge, with a few seconds delay, covering the bridge with its fire breath. If you run onto the bridge and then back, you can safely take cover from the fire, as well as actually see the dragon swooping in. Partway across the bridge, on the right side, is a staircase that leads to an unlockable shortcut back to the previous bonfire, and one of the two paths ahead that proceed into Undead Parish. Once the drake has appeared and landed, it's safe to run over to the staircase. The hollows will likely die to the fire, otherwise you can just run past them. If the drake hasn't spawned, you can also sprint across the bridge as fast as you can (you can remove all of your equipment to run faster here) and dive to cover behind the corners shielded from the fire. This is easier to do with a bit of Endurance. However, you risk getting hit by the flames for Counter Damage seeing as you're sprinting, so you could risk dying. Once you've reached the halfway point, to cross the remaining section of the bridge, run to the corners closest to the drake, where you're shielded from the flames.. If you're below the staircase, run up, leading the dragon to breathe fire, and then back down the stairs to dodge it. The moment the fire disappears, run up again, sprint, and then immediately take cover behind one of the corners facing the dragon. After standing in the corner for half a minute or so, or if you attack it with a bow or throwing knife, the dragon will jump down onto the bridge. The moment it starts doing this, sprint across the bridge; the drake won't be attacking you for a few seconds. Sprint into the doorway, and you'll have enough time to light and rest at the bonfire there before the drake will attack you again, which will prompt it to fly away. You can skip the dragon's first appearance in the Undead Burg, which will permanently stop the dragon from spawning at the larger bridge, until you trigger its first apperance. There are two methods of doing this. The fastest method is to enter the Undead Burg, and when you reach the fog gate, don't walk through it. Instead, there's a high-precision jump you can make which will take you all the way down to the Lower Undead Burg (video). Facing the fog gate, turn right. Using the stairs for extra height, jump over the fence, aiming alongside the wall. If the jump is made correctly, you'll land all the way down in Lower Undead Burg. There, you'll be attacked by two dogs and three Undead Assassins. You can fight them or run from them; next you'll head left and run upwards, away from the foggate. There are three more dogs and three more Undead Assassins here; again you can fight them or run straight up the stairs here to unlock the shortcut back to Upper Undead Burg. Head through the left exit here to reach the Undead Burg bonfire; be careful not to step near the bridge further below to avoid spawning Hellkite. You can also skip Hellkite's first appearance, stopping it from appearing at the bridge, by only entering the Undead Burg through the Undead Parish. This is most viable to do if you have the Master Key, as a starting gift or by being the Thief class. With the Master Key, go down the stairs in Firelink Shrine to get to New Londo Ruins. Then, immediately go up another set of stairs, where there is a doorway that can be unlocked with the Master Key. This'll take you to Valley of Drakes. Ignore the tunnel entrance nearby; instead run alongside the mountain wall, past the Undead Dragon and two drakes, then turn right once you're at the bridge, by the collapsed tunnel, to reach an elevator that goes to Darkroot Basin and a bonfire. If you don't have a Master Key, you can do the same thing by killing Ingward in New Londo Ruins and unlocking the Seal, though it will be far more difficult and most likely not worth it. After reaching the Darkroot Basin bonfire by either method, continue past a Halberd Black Knight, and keep running upwards until you reach Darkroot Garden. Take a left turn and run into the stone entrance to reach Undead Parish. From here, run past the blacksmith, all the way up the stairs past the bonfire, through the church and all the way down the steps, then down a ladder through three rats and you'll reach the staircase below the bridge. Walk up the stairs and the Hellkite Dragon will not appear. For first time players, it is highly recommended to avoid attacking this dragon until you've leveled up a bit. Remember that the dragon can regenerate himself when his HP drop below half, so your damage-per-second must be able to overcome his regeneration. In NG, a bow damage of about 50 per shot can overcome his HP regeneration if you shoot consistent enough. Try levelling up your Strength/Dexterity or upgrading the bow first if you think you can't do it consistently, to make room for errors. Equip Hawk Ring to be able to shoot him from longer range. The farther you are from him, the more time you have to escape from his fire. If you use Composite Bow, the Hawk Ring may be mandatory to use because of its short range. Equip Red Tearstone Ring to boost damage. Especially useful if you shoot from under the bridge, as you are in no risk to get damaged. 3 places to shoot him from. Clear the enemies first and learn the timing. The bridge - easier to target (and can get headshots) but you need to be quick on your feet. Shoot him not only when he's landing or perching, but also when he's moving, getting down from his perch, and jumping up to his perch. Under the bridge, near the sword-wielding Undead Soldier - 100% safe, but much smaller target, mostly the wings and tail. This is the preferred place to shoot him from if you just want to get the Drake Sword. Aim at the upper part of his tail instead of the tip (it's easier this way). He'll hop to the bridge, swinging his tail to your right side. Without getting out of aiming mode, move your reticle to the right, his tail will enter your line of sight. Shoot his tail here too (usually only enough for 1 shot, though) before he's back to his perch. Under the bridge, near the door to the Small Undead Rats - 100% safe, even smaller target, but can get headshots. When you shoot from here, always start with a headshot. Then, you can get several shots (1-2 with greatbows, potentially even more with normal bows) when he hop to the bridge and back to his perch. This spot is also within soul sorceries range, however manual aim is required. Note: The easiest way to defeat the dragon is to use a bow, however this is not your only option, you can use the Binoculars to make aiming easier for projectiles other than arrows. Either go full Fire-resistant heavy, or go unarmored. Middle-weights will only get killed because the flame is too strong for medium armors, while the weight makes rolling not fast enough to roll to safety. You won't need a shield because you'll be two-handing your weapon and blocking the flames will only get you stun-locked to death. Full armor: Black Iron Set +5, Flame Stoneplate Ring, Flash Sweat pyromancy (this cuts the fire damage greatly). Light armor: Havel's Ring to offset heavier weapons. Dark Wood Grain Ring also helps as you can roll a little bit faster than normal fast rolls. Use weapons that have a reasonably fast attacking speed, not ultra greatswords or great hammers. At the top of the stairs, on the right (assuming facing dragon) side, running all the way forward to the rail is a safe spot against the dragon flames when they're breathed from the front. Moving backwards from that spot to the wall is a safe spot against the rear flames. Moving between these two spots avoids the horizontal bridge flames, and it is close enough to the stairs that one can roll down them and avoid the overhead flame move. For light armors: Once the dragon has been lured with a bow shot, it will breathe flame and then will take 4-6 steps forward onto the bridge. Wait until a talon is exposed then hit the claw from a position just above the stairs with a 2-hander or you can attack his head with 2-handed attacks (even with heavy weapons) as soon as he landed, when he's still in the "landing" animation. Then quickly retreat down the steps to avoid the overhead flame. After the overhead flame, let him take about 3 steps and then run back up. If you don't, the dragon will fly back to his perch and potentially heal himself. If you run back up too soon, he'll do another overhead flame, so you need to be careful here. If your timing was about right, he'll return to his horizontal flame + walking on bridge pattern. Repeat with two handed attacks to the claw until he dies. Be wary that there's very little time between your strike and his retaliatory flames. For full armors: You can challenge the dragon directly after luring him to the bridge, as the armor's physical resistance and Poise will take care of the claw attack, while the high Fire resistance in addition to Flash Sweat will make the flames do insignificant damage. Just remember not to fight the dragon when the Flash Sweat expires. 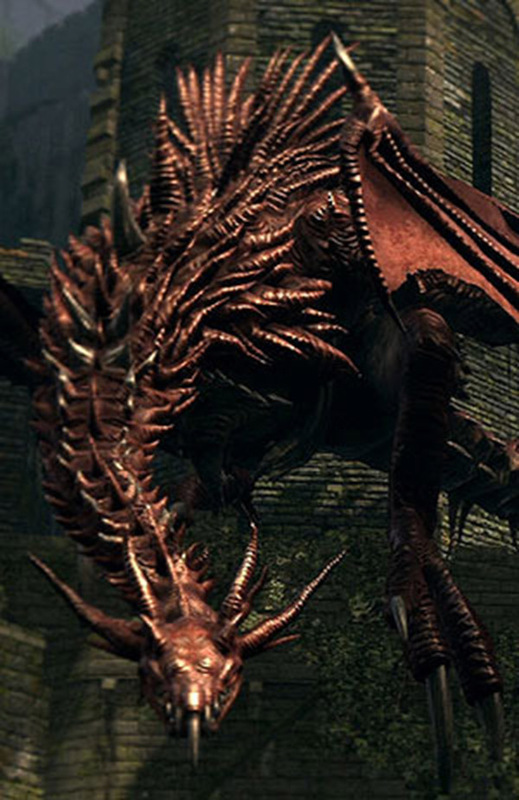 In NG+ the Hellkite Dragon's health regeneration will become a very significant obstacle for most players, but it is still possible to kill him. Players have found that it is possible to time hits just right, not triggering this animation. In case of the Hellkite Dragon, the tail has about 10.87% of his HP. Several methods can be used to obtain the tail. Ranged for new players: get a Short Bow and 50+ Wooden Arrows at the Male Undead Merchant in the Undead Burg. Go to the bridge segment below the drake, above the shortcut to the bonfire, where you can see its tail hanging down. Shoot it until it falls off. Melee: with any basic weapon, pick up the Gold Pine Resin from the locked room in the Undead Burg, you need either the Master Key or the Residence Key from the Male Undead Merchant. On the bridge where Hellkite sits, from the staircase partway across, run to one of the corners where you're shielded from the flames. Wait there until the drake jumps down, or attack the drake with a ranged weapon to trigger it to jump down. Once it starts moving, run out from the corner, and *then* apply the Gold Pine Resin to your weapon. You need to stand in front of it for this long to trigger an attack. Run forward along the right side of the bridge, and attack its tail 3-5 times, depending on your weapon, and it will be cut off. You can then run to the safety of the bonfire in the room behind it. Halberd: If the Halberd weapon has been acquired, players can shoot at the tail from underneath the bridge, switch to the Halberd, and perform the heavy attack for a large amount of damage when the drake lands in the middle of the bridge. Miracle Users: From underneath the bridge you can shoot at his tail with a bow but after he is hit with an arrow he leaps from his perch and walks along the bridge for a small distance. While he does this, his tail is dragged along the left side of the bridge with respect to the sunlight altar bonfire. While the tail is being dragged along the side you can cast an area of effect ranged miracle like Wrath of the Gods to quickly destroy the tail. Use the red tearstone ring to increase your damage. Alternatively to the above you can use binoculars and the lightning spear. Use the binoculars to aim at it's tail when it's farthest to the right and fire when it's at the same position. When it jumps down run and hit it one or two times depending on your weapon then run past the sunlight alter bonfire, through the gate to the left then head down the ladder to the right. Keep moving until you get to the stairs that lead you back up to the top of the bridge. From there repeat until the tail is cut. If you quickly run through the shrine after you have baited the dragon into landing on the bridge, you can score a few extra whacks at the tail. Its tail should be to the right of the sunlight altar when it perches. When the tail is hit, the dragon may fly to the bridge as normal or may fly away instead, make the strike count!